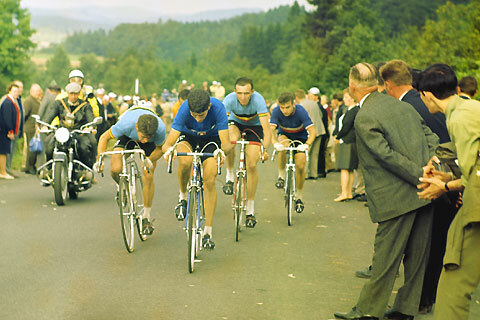 Felice Gimondi (Italy) leads Guido Reybrouck (Belgium – left), Jo De Roo (Holland – obsured), Martin Vanden Bossche (Belgium) and Lucien Aimar (France) near the end of the 1966 World Road Race Championship at the Nurburgring, Germany. They finished in 7th to 11th places at 35 sec to Rudi Altig, Jacques Anquetil and Raymond Poulidor. Eddy Merckx was just yards behind. Scanned from original 35mm slide.